Based on the hit anime. 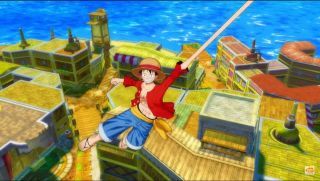 The fun, colourful trailer for Bandai Namco's *deep breath* One Piece: Unlimited World Red - Deluxe Edition appears to finish halfway through, before offering up another couple of minutes' worth of boisterous anime action. It's an enhanced version of the game based on piratical anime One Piece, with a newly 60fps framerate, and "over 40 pieces" of downloadable content included. Unlimited World: Red - Deluxe Edition will hit PC, and Steam, on August 25, and here's what it looks like—i.e. enjoyably over the top.